If you want to retrieve messages that you have mistakenly, or voluntarily, deleted, WhatsApp saves a copy of your messages in the WhatsApp/Databases folder on your Android device daily (at 4 a.m.). The procedure to recover them will depend on their age; however, you will not be able to recover messages older than seven days, the maximum time that WhatsApp keeps the backup copies. After you have chosen to restore the messages, deleted messages will appear in the Chats window. 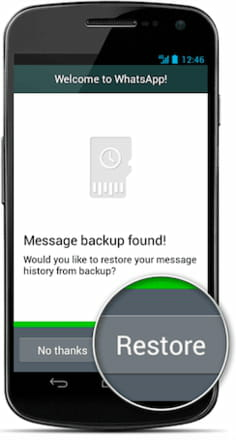 If some messages don't appear, they may be part of an older backup. N.B. Before uninstalling WhatsApp, we recommend that you back up your conversations. Before you start restoring your older messages, keep in mind that your last conversations will be erased during the process. You will only be able to recover messages from backups of the last seven days. Additionally, your cell number, registered in WhatsApp, must be the same one that you had when the backup was made. To start the restoring process, copy the contents of the WhatsApp/Database folder, located in the internal or external memory of your device, to a folder on your PC. Then, uninstall WhatsApp. Open the folder where you copied the files (on your PC), and delete the file msgstore.db.crypt7 or msgstore.db.crypt8. Once you have done this, choose the backup that you want to restore and rename it. msgstore-Year-Month-Day.1.db.crypt7 should become msgstore.db.crypt7, and msgstore-Year-Month-Day.1.db.crypt8 should become msgstore.db.crypt8. When you see the number of messages retrieved, click Continue. Published by MelissaCCM. Latest update on December 9, 2017 at 09:35 AM by Olivia Long. This document, titled "How To Recover Deleted WhatsApp Chat History on Android," is available under the Creative Commons license. Any copy, reuse, or modification of the content should be sufficiently credited to CCM (https://ccm.net/).